But three years later when I received White House invitations to attend the Washington DC reception for the Vice-Premier of the Peoples’ Republic of China, it was Deng Xiao-Ping who arrived; not a hard-line inheritor of Chairman Mao’s revolutionary precepts. In 1977, Deng Xiao-Ping wrested power from China’s conservative communist ideologues and in 1978, opened China’s socialist economy to private ownership. 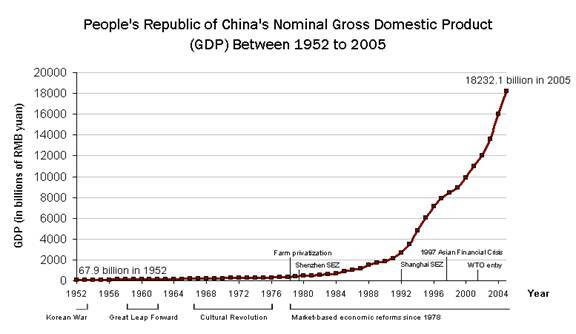 By 2005, China’s private sector had expanded to 70 % of its economy and China became an economic power in only 25 years. While Mao Tse-Tung had successfully steered China away from Western suzerainty, it was Deng Xiao-Ping who put China on the path to financial and geopolitical power; a path that would be as rapid as it would be unsustainable—for China’s explosive growth was founded in large part on excessive credit creation in the West. 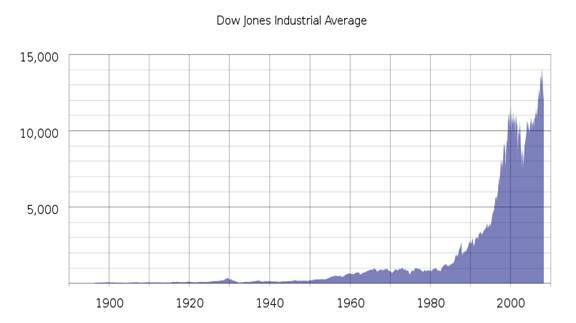 The correlation between the rise of China’s GDP and the rise of the Dow is unmistakable. It’s also the reason why China’s growth is unsustainable. 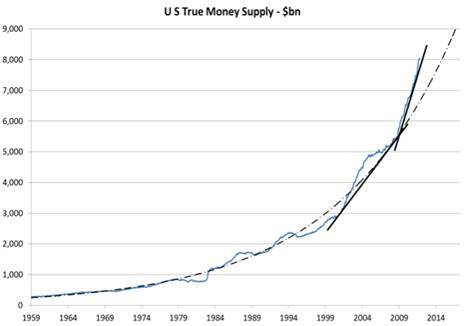 China’s rapid growth was fueled by the unprecedented expansion of the US money supply—an expansion directly responsible for America’s exploding appetite for consumer goods from China and the US dot.com stock market bubble in the 1990s. My video, Dollars & Sense show #11, titled The Fix Is In, explains Greenspan’s flawed tenure at the Fed, see http://youtu.be/65CnOUhEFIk; and, while there are reasons to explain Greenspan’s shortcomings, none can reverse the damage he has done. Today, China’s late run at capitalism’s table is fueling the very collapse von Mises predicted; for if Greenspan’s credit expansion was excessive—and it was—China has set in motion an even larger expansion. To offset the global collapse in demand, China expanded its money supply in 2008 by an extraordinary 150 %, an increase driven by China’s need to maintain economic growth or risk losing political control. During each great wave: …Food and fuel led the upward movement. Manufactured goods and services lagged behind. These patterns indicated that the prime mover was excess aggregate demand, generated by an acceleration of population growth, or by rising living standards, or both. Von Mises’ predicted flight into real values—gold—is now underway despite the best efforts of today’s kreditmeisters to diminish the allure of the only safe haven left to those fleeing paper money’s now burning mansion. …The talkers on Bloomberg are discussing stocks to buy. They are unswerving bullish. It never occurs to them that hard times lie ahead and that this is not the time to buy stocks…My advice -- sell any stocks you still own -- sell into all rallies, or stay out of stocks completely. 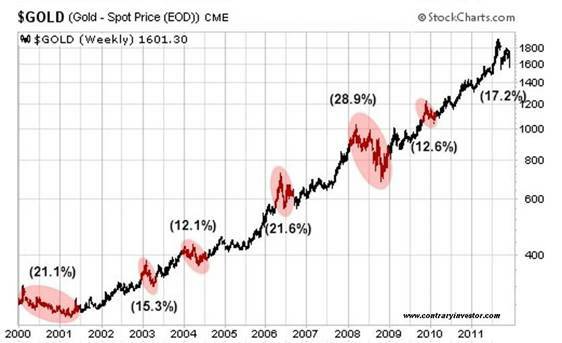 I continue to like gold in all its forms, but I'm afraid that gold mining stocks will tend to go with the general market. Personally, I'm staying with my gold mining stocks until the bitter end. I continue to believe that we'll see a final hysterical blow-off in gold (the metal) that will carry the mining stocks with it. The crackup boom will end as von Mises predicts in monetary disarray, i.e. the debasement of currencies and possible hyperinflation where paper money loses all value. Today, money is no longer a store of value. It’s a trap for the unsuspecting that has already been sprung. Yes, Dr. Keynes, Dr. Friedman, Dr. Greenspan, Dr. Bernanke, et. al. while there are no limits to economic hubris, there are limits to monetary imbalances. The thesis at the beginning of this article is that China's rise in GDP was caused by over-expansion of credit in the the US and Europe and that its growth is therefore unsustainable. China has the productive capacity: real factories, massive human resources, massive amounts of its own capital, access to natural resources around the world, and its own internal market. The Chinese middle class is predicted to grow by 350 million by 2030. It has solid alliances and trading partnerships with other BRICS countries, with Japan and Korea, Argentina, African countries, etc. The idea that its growth can't be sustained because it is dependent on US credit is fatuous and ignorant. Though not without its problems, China's economy is solidly based. It is not run by and for criminal"high finance". Its banking is at least 69% government owned and serves the aims of their extremely successful centrally planned economy, run much more for the people than the US economy is. And they're kickin our butts. I'd say they have more economic freedom than we do: more freedom from internal and external parasites. Unsustainability is what we see in the downward-spiraling, self-delusional neoliberal west. Have public morals declined so much that, upon another stock market collapse (ala 2008 certain -- Gretchen Morgenson, NYT), no one will have been found, afterward, to have jumped off a tall building of his own accord ? ?